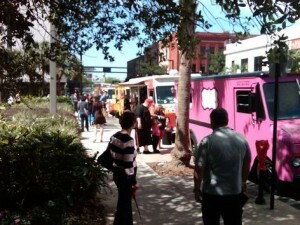 The food truck fad that has swept Tampa doesn’t seem to be going anywhere. The newest addition to the Food Truck phenomenon is a Monthly Downtown Lunchtime Food Truck Fiesta. Starting on November 2 and continuing on the First Wednesday of the month, The Mayor’s Food Truck Fiesta will host a hodgepodge of mobile meals on Franklin Street between Madison Street and Kennedy Boulevard. Follow the Food Truck Fiesta on Facebook for a line-up of monthly participating trucks. The event during lunchtime from 11am to 2pm.